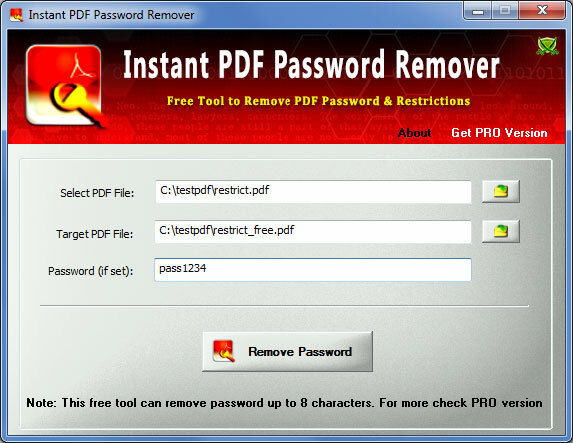 Instant PDF Password Remover is the FREE software to instantly remove Password of Protected PDF file. It can remove both User (Document Open) & Owner password along with all the PDF file restrictions such as Copying, Printing, Signing etc. These days we receive all kind of bills, bank statements protected with long and complex password. Forget about remembering it but typing those passwords every time is highly irritating task. Now Ã¢â‚¬ËœInstant PDF Password RemoverÃ¢â‚¬â„¢ can help you to quickly remove the password of such PDF files making your life easier. You can just right click on PDF file and select Ã¢â‚¬ËœRemove PDF PasswordÃ¢â‚¬â„¢ to start the removal operation. Here are the main features * Removes PDF User or 'Document Open' passsword * Removes PDF Owner Password * Remove all the Restrictions from protected PDF file * Support for PDF documents protected by all versions of Adobe Acrobat Reader * Supports Standard RC4 (40-bit,128-bit), AES (128 bit, 256 bit) encryption * Right click Context Menu * Drag & Drop support for easier selection of PDF file. * Very easy to use with simple & attractive GUI screen * Integrated Installer for local Installation and uninstallation. 'Instant PDF Password Remover' works on wide range of Operating systems starting from Windows XP to Windows 8. ChromePasswordDecryptor is the FREE tool to instantly recover all stored passwords by Google Chrome browser. Word Password is advanced password recovery tool for MS Word documents (*.docx, *.dotx, *.docm, etc) with AES encryption (MS Word 2007 / 2010 / 2013 formats). Highly optimised multithreaded code and GPU utilization guarantee fastest recovery speed. PDF printer tool to print secured PDF documents. By using our advanced PDF Unlock tool you can unlock secured PDF files and print PDF documents. It is so common that people to forgot a Windows 7 password. Fortunately, Asunsoft Windows Password Reset can help easily unlock Windows 7/Vista/XP password without files lost. It is the fastest way to unlock Windows 7/Vista/XP. What are you searching if the right solution is there? Quickly use PDF Unlocker tool which is one of the outstanding tool that allows users to remove owner password from secured PDF file as to copy, print, modify content etc on PDF file. Download Free PDF Unlock Tool to unlock secured PDF applications. This PDF Unlock Tool remover PDF restrictions and helps you to access PDF files easily. Download PDF Unlock Tool now. Are you using Windows 8 operating system and forgot the login password? Don't worry, Asunsoft Windows Password Reset Advanced can easily reset any WIndows password including Windows 8, 7, Vista, XP, Server 2008/2003/2000. Excel Password is advanced password recovery tool for MS Excel spreadsheets in MS Excel 2007 / 2010 / 2013 format: xlsx (XML), xlsb (BIFF12), xltx, xlsm, etc. Highly optimised multithreaded code and GPU utilization guarantee fastest recovery speed. This site does not contain serial number, crack, keygen Instant PDF Password Remover serial number : serial number is the simplest type of crack. A serial number(cdkey,product key,etc) is register the program as you may already know. a crack or keygen may contain harmful software. If you cannot find the exact version you want, just give it a try. for more information read .nfo/.txt/.diz file include in zipped file.